No, we still don't have an iPad version of the Instagram app, but another longtime holdout has gotten some big(ger) screen love. Apple has finally given its Apple TV Remote app a refresh tailored for the slate's display. The iTunes listing says that in addition to the expected visual improvements, there's also lyrics and "playlists for music and chapters." That's in addition to captions section for movies and TV shows. 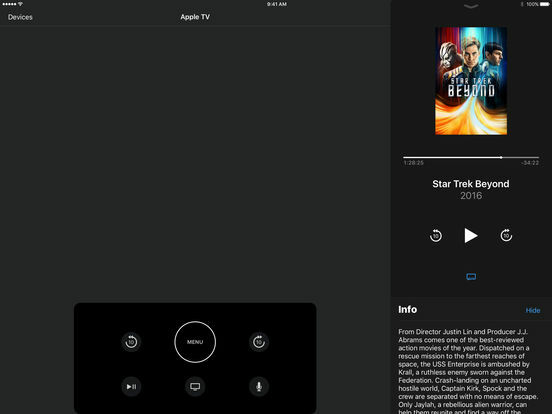 Last February, Apple's Eddie Cue and Craig Federighi said that with the then-forthcoming app that it would be a "full replacement" for the Apple TV remote. At the time, he was speaking directly about how an iPhone armed with the app can be a second controller for games. Now, the same functionality (with Siri voice commands, no less) on a more substantial screen is a reality. Don't have an iPad? Well, then you'll have to settle for the usual "general performance and stability improvements."